Microban® and Florida Tile have teamed up to provide antimicrobial protection for ceramic tiles. 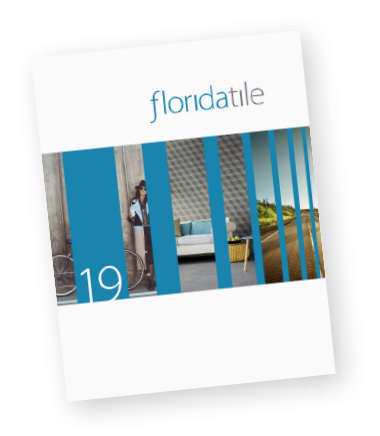 Florida Tile ceramic tiles are well known for their beauty, durability and performance; the addition of Microban® built-in technology featuring silver provides a continuous level of protection from the growth of common microbes. The patented Microban® technology consists of treating the ceramic material with a formulated antimicrobial additive capable of expressing high antimicrobial efficacy using established international laboratory protocols. This innovation is available on several collections and colors in both traditional porcelain and laminated porcelain tiles, in a wide range of sizes and in the natural and honed (lappata) surfaces. This provides an amazing tool in the hands of architects and designers looking to develop exceptional environments with high performance when it comes to hygiene, cleanliness, safety and ease of maintenance; like for example hotels, restaurants, healthcare, kitchens, bathrooms, wellness centers, spas, gyms, shopping malls, and all public and private space buildings. How clean are your tiles? Micro-organisms are a fact of life. They are everywhere, all around us, all the time. However hard we try, there’s no getting away from them. Some are good for us, others are neutral, but a few are dangerous. So it makes sense to do what we can to prevent their potentially harmful and undesirable effects. Under right conditions of warmth, a food source, time and a little humidity, microbes can grow and divide extremely rapidly, and bacterial populations can double as quickly as every 20 minutes. In addition, microbes can persist on inert surfaces for a long time. On average, there may be more microbes on your hand than people on Earth. Microbes on floors can be a source of cross-contamination, where microbes can transfer from one surface to another and from an area to another. This transfer can take place by human contact with the contaminated surface (for example touching with hands or shoes). Dirt and microbes are continually being brought into the home through foot traffic from people and also pets! The goal of such antimicrobial protection, is to minimize the number of microbes which colonize a surface and therefore reduce the possibility of the microbes transferring to other surfaces where they may cause potential issues. Looking at hotspots within the home - the kitchen and bathroom have the potential for the highest number of microbes which can rapidly spread from one surface to another. Bathrooms and kitchens - environments where the proliferation of microbes is prevalent due to the presence of water and nutrients.